Torquay's Wales Under-21 international winger Billy Bodin is set to be out for up to nine months after suffering knee ligament damage. The 22-year-old, who is out of contract in the summer, limped off in the 1-0 defeat by Dagenham and Redbridge. But he scored only six goals in 73 appearances during that time, having found the net five times while on loan. Son of former Wales international Paul Bodin. Scored five goals in 19 games while on loan at Torquay in 2011. Joined Torquay for around £70,000 in the summer of 2012, scoring six goals in 73 games. 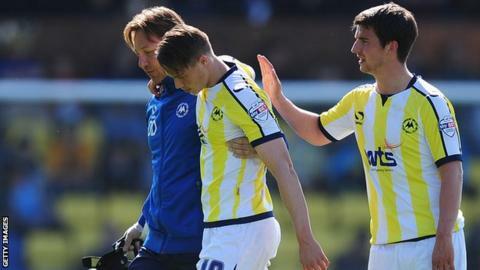 "He had prepared for the worst because there was an issue with it a week or so ago, but he thought that he may get away with it," Torquay boss Chris Hargreaves told BBC Sport. "But it's not like when I was his age, an ACL [anterior cruciate ligament] would have finished your career, nowadays 99% of players return and are fully fit from it. "I'm sure that'll be the case with Bill as he's a very fit young lad." Bodin is a free agent in the summer and Hargreaves says the Gulls must discuss his future, even though it could be 2015 before he plays again. "We have a duty of care to get him fit. Over and above that then we need to have a think about it with Billy and his dad Paul and make a decision about that. "He's under 24 so he can go on a Bosman which would be a loss to the club because we paid money for him. "But our short-term thoughts are 'lets just get him fit for him and his career' because it's a bad injury for anybody. "At the moment we just want to get his operation done and start his rehab."